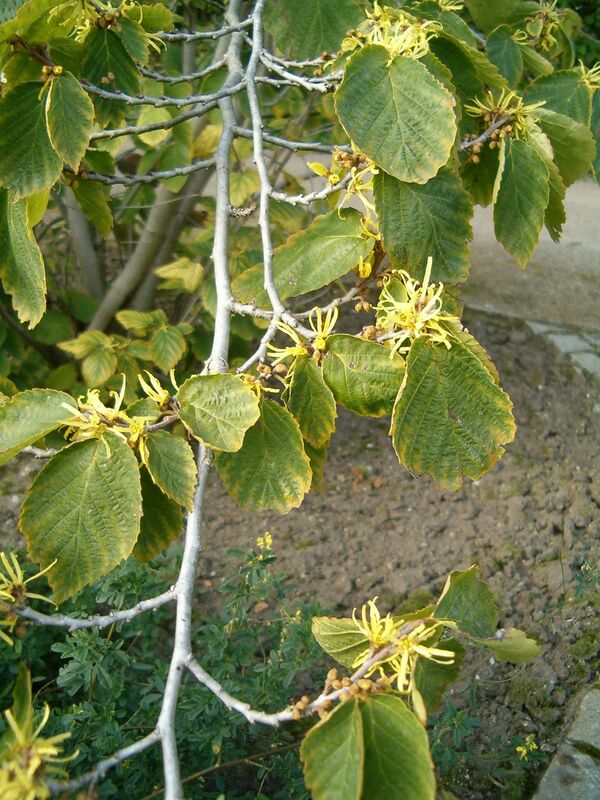 Hamamelis virginiana.FlowersLeaves_BotGardBln. commons.wikimedia.org. (Accessed 5/2015). 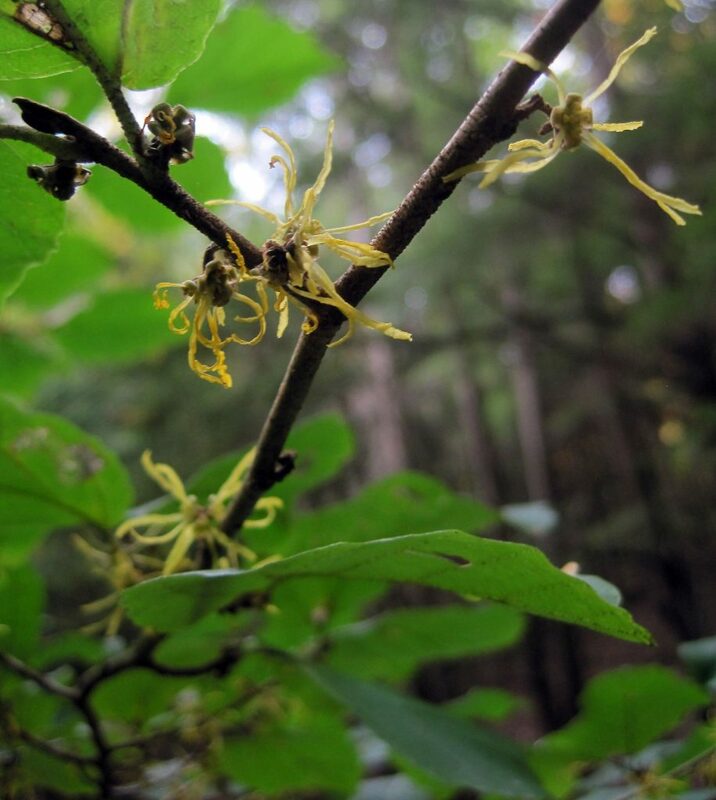 Hamamelis virginiana is a shrub to 5 m; usually multistemmed, stems often almost horizontal, bark dark gray; leaf scar small, stipule scars present; winter buds hairy, yellowish to tan, slightly stalked, naked (Harlow 1946; Petrides1972). Leaves alternate, to 15 cm long and broad, wavy-toothed, base uneven. Flowers yellow, petals 4, (Dirr 1990), to 2 cm long, linear, curled; blooming Oct-Nov.
Hamamelis virginiana (American Witch–Hazel).Del Orloske MALD. 10/2016 (Accessed 2/2017). Fruit dry hairy capsule, 1 cm, ripens in 1 yr. Seeds eaten by grouse, wild turkeys and squirrels. Twigs eaten by deer and rabbits (Martin, et al., 1951). Habitat: Understory or edges of undisturbed, moist forest. Prefers moist, rich, open woods, soil pH 4.5-6.5 (USDA, NRCS 2010). Very tolerant of shade, index 8-10. Intolerant of salt, flooding, drought, soil compaction (Hightshoe 1988). Hamamelis virginiana fruit with seeds.JackPine.Copyright © Nova Scotia Wild Flora Society.nsflora.ca.Creative Commons license/Attribution-NonCommercial-ShareAlike 2.5 (Accessed 3/2017). 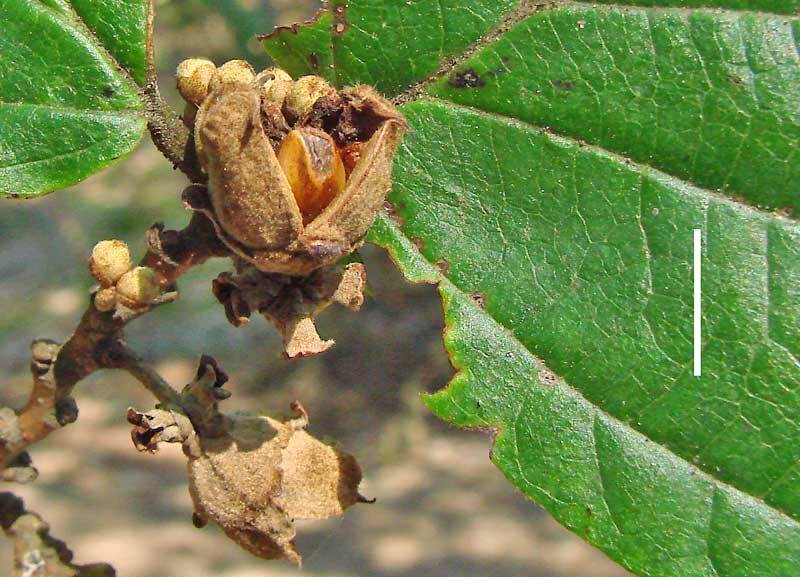 Notes: Susceptible to Phyllosticta hamamelidis (Deuteromycotina) that causes leaf spot and blight, appearing as irregular brown spots with a narrow, dark purple margin, later, tiny black fruiting bodies may appear on dead leaf tissue. Sometimes bark can be infected by Botryosphaeria obtusa (Ascomycotina). 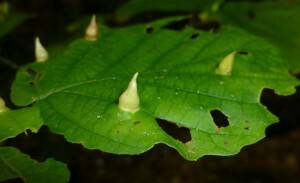 Leaves fed on by several insects including Hormaphis hamamelidis, the witch-hazel leaf gall aphid. This insect forms pale green, pointed, cone-shaped galls, ca 1 cm tall, on leaf surfaces in spring. It feeds and reproduces within the gall and numerous winged offspring are released later in the season. The leaf miner Camereria hamameliella, (Gracillariidae, larvae of a leaf blotch miner moth) also attacks witch hazel leaves as does the eastern tent caterpillar Malacosoma americanum (Sinclair et al. 1987; Agrios 1988; Johnson and Lyon 1991). Hormaphis hamamelidis.Allen Norcross.New Hampshire Garden Solutions.nhgardensolutions.wordpress.com (Accessed 6/2015).